The parallel tensioning of all bolts at the same time is sometimes not possible. In that case, the bolts have to be tightened one after the other ("crosswise tensioning"). 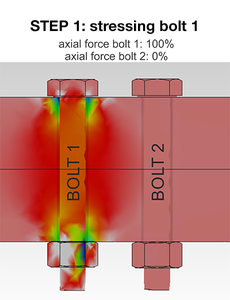 Sequential bolting is difficult because the axial bolt forces interfere with each other. The stress pictures on the right (please click to enlarge) illustrate that bolt prestress forces depend on bolt forces in the neighbourhood. 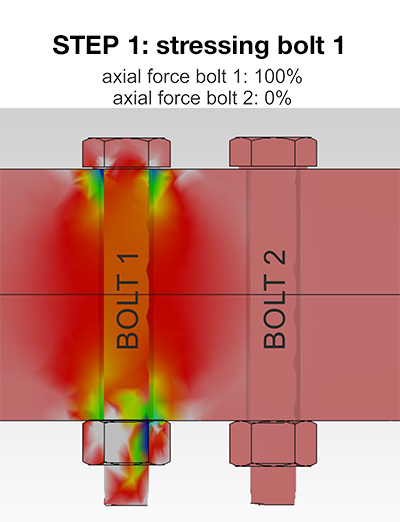 In step 1, bolt 1 is strained with 100% prestress force. In step 2, its neighbour bolt 2 is strained with 100% force as well. 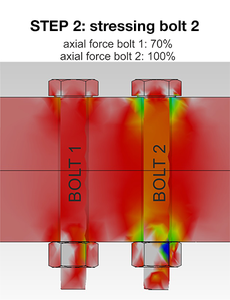 Prestress force in bolt 1 drops to 70%, and time-consuming retensioning is necessary. Similar situations are to be found on all flanges - regardless of whether circular or any other shape - where many bolts are situated close together. If the tensioning of all bolts at the same time is not possible, a detailed tensioning strategy needs to be developed.